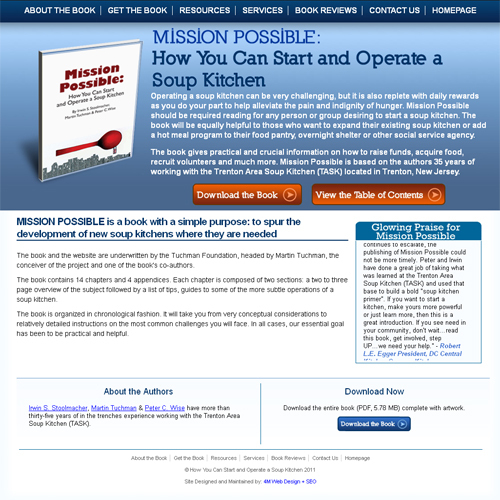 We’re excited about the launch of Mission Possible: How You Can Start and Operate a Soup Kitchen’s website, located at www.startasoupkitchen.org. Mission Possible provides essential information on locating, managing, staffing, publicizing and funding a local soup kitchen. Further it offers practical insight on where to find food and how to serve the meal. After careful analysis and research, we moved forward with a web site that has been built from the ground up, in an effort to remain consistent with today’s Internet technology. The user interface is easy to navigate and any information is no more than two clicks away. We designed a prominent “Download Now” button, which we placed on every page. The homepage also offers a scrolling “Glowing Praises” section.